All of these papers are available through the digital program on the IFLA web site. 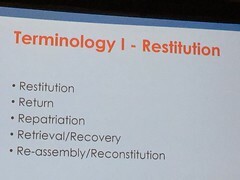 Restitution - Each term means something different. Often used for physical materials. 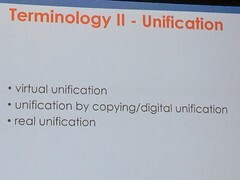 Digital unification - what role can IFLA play? 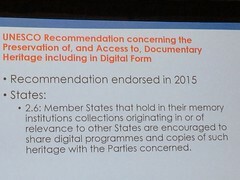 Yes, documentary heritage items are in countries or institutions different from the county of origin. People are positive about the fact that this conversation is happening. 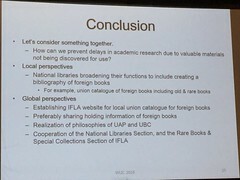 What should IFLA's role be in this? What role can each of us play? Over its history, Korea has been overtaken and people have immigrated to other countries. Korea's cultural items became scattered across many countries. Korea is currently a divided country. The National Library of Korea began in 1945. It began digitizing in 1996. (See photo below.) 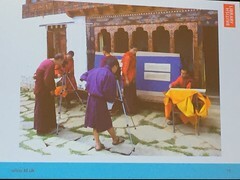 Digitization has helped the library save the content of items which were deteriorating. 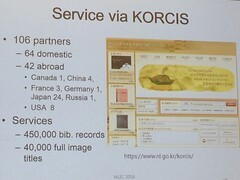 NLK is also collaborating with overseas Korean studies librarians, oversees Korean cultural heritage foundation, the a Cultural Heritage Administration, and others. NLK is working with the Korean Association for the Preservation of Old Books. 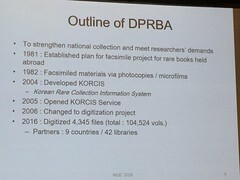 She noted that many materials on Korea have been digitized by NARA in the United States, and which are available online. Please note that you can use Google Translate to obtain a translation of this paper. The paper is available on the IFLA web site. Why this project? 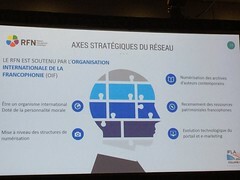 The answer can be found in a quote in the paper, where it is stated that the presence of the French language in the digital space is at stake. This project has brought together people from 19 countries. Please read the paper for information on it. The British Library collections reflect global history, not just British history. Some collaborators are small scale, yet they can still have a large impact. Some collaborative projects come out of support from philanthropic support provided to other national libraries. 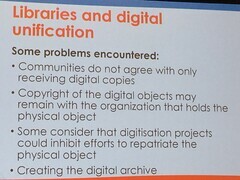 She noted that sometimes the digitization project is part of a larger project. The impact of mass digitization project can take time to be realized. 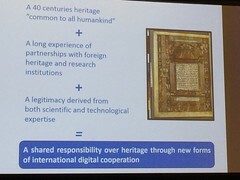 As an example,she spoke about a digitization project of Hebrew manuscripts where a copy of the digital files will be given to a library in Israel. One of their largest partnerships is with the Qatar National Library which is interested in materials on the Gulf region. This partnership has included technical collaboration and the creation of school/academic materials. Digitization allows access to be given to fragile items that are physically housed around the world. They have also done 3D digitization/modeling which has allowed people then to engage in 3D printing. She noted that they are entering into a partnership with the National Library of Korea, its newest partnership. 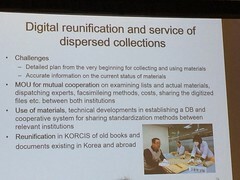 This will help to provide digital reunification of Korean materials held in the British Library. 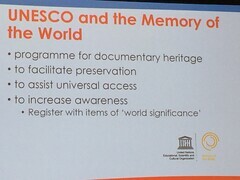 They are part of the endangered archives program. The physical items remain in situ. A coy of the digital file is given to the owner of the physical item. She noted that digitization does not need to use high tech setups. 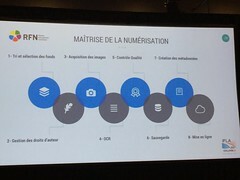 Again, you can use Google translate to read this paper (which is available on the IFLA web site), which is written in French.